Josef Albers (1888–1976) is best known for his series of paintings, Homage to the Square, in which he endlessly explored color relationships within a similar format of concentric squares. Less well known are the studies he made for these compositions. With approximately eighty oil sketches on paper, this exhibition reveals a private side of Albers's work. These sketches were never exhibited in the artist's lifetime and have rarely been seen after his death. On view are early studies (1930s–early 1940s), studies for Albers's Adobe series, inspired by Mexican architecture (1940s–early 1950s), and studies for Homage to the Square (1950s–1970s). These vibrant sketches provide insights into the artist's working process and, in contrast to the austerity and strict geometry of the final paintings, are remarkable for their freedom and sensuality. Works are drawn from the Josef and Anni Albers Foundation in Bethany, Connecticut and the Josef Albers Museum in Bottrop, Germany. The exhibition, which is traveling to multiple venues in Europe before coming to the Morgan (the only U.S. venue), is organized by the Staatliche Graphische Sammlung in Munich and the Josef Albers Museum in Bottrop. This exhibition is generously supported by The Josef and Anni Albers Foundation and the Rita Markus Fund for Exhibitions, and by contributions from Mickey Cartin, Nancy Schwartz, Carroll Janis, Inc. and The Hilla von Rebay Foundation. 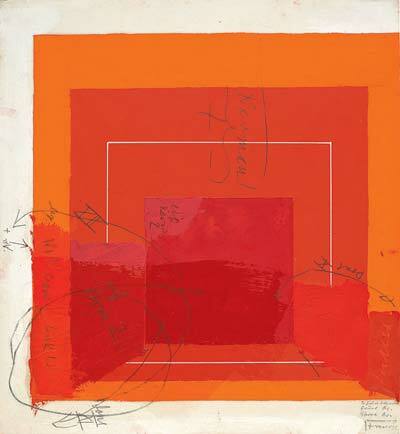 Josef Albers, Color Study for White Line Square, oil on blotting paper with gouache, pencil and varnish, The Josef and Anni Albers Foundation, inv. no. 1976.2.22.